quirky my looks get, which is something that I actually really like. Love this brown on you!! That coat is gorgeous, and the color looks great on you! I love that coat!! It looks great belted. i love the color of that coat. And the texture of that skirt! gorgeous! This is such a cute outfit. I love your new brown coat! 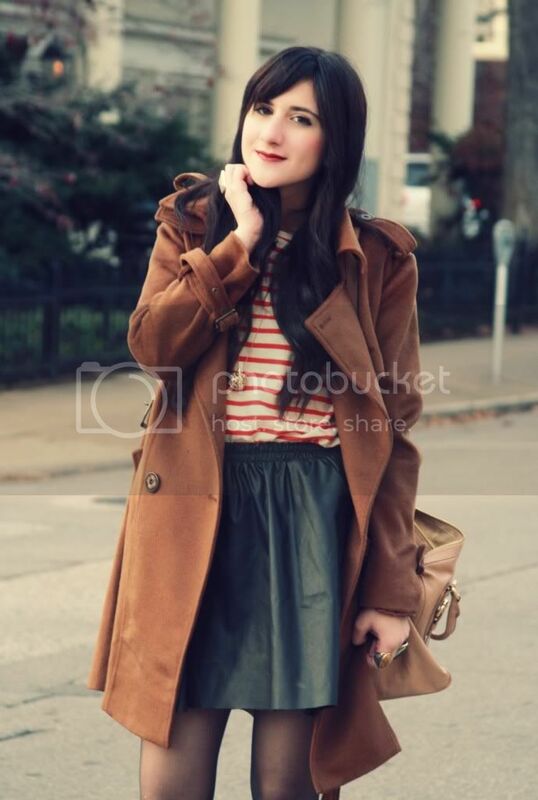 The red striped top and the leather skirt are perfect matches with the brown. Love it! Have a great weekend! I don't see anything quirky. You look lovely in this coat. The coat is lovely and so is that skirt! Beautiful, beautiful coat! I love the shade, and it goes with so much. Beautiful skirt too! Your coat is seriously gorgeous - I love the colour on you! <3 and I adore your loafers! I'm so smitten by that skirt! That coat is perfect to be freezing in style! Just like Laura I have my sister she's so funny, never fails to make me smile, enjoy the sugar! Beautiful photos! The brown coat is amazing! It looks perfect on you! Hi sweetie!! !how are you? ?thanks for visited my blog. I love this coat! !i want one in brown color!!! Lovely coat. Nice lines and warm colors. Ideal for late fall. Also i love those big brown buttons. aw! so cute that your bestie makes you smiley :) mine does too! love that skirt! Such a cute jacket ! Fabulous coat, adoring the shoes! you look amazing, i love it! Love this outfit, especially your loafers. I feel like you can seriously pull anything off. currently in an airconditioned room and all i could think of is putting on a coat just like that right now! un besazo bien grande con muchísimo cariño cielo.. This is the perfect wool trench, looks cozy without losing the classic silhouette. You look really really cute hun!! 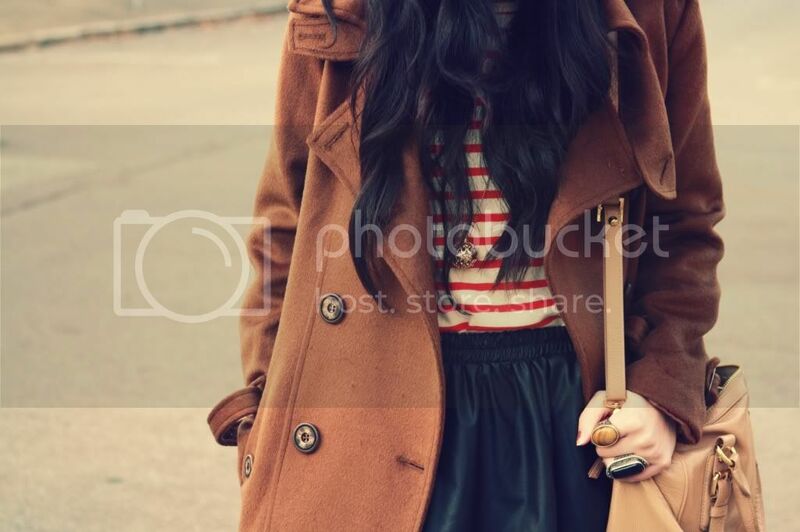 Really like your coat in combination with the striped shirt. Cute look as always! lovely outfit. i love your skirt! Nice photos! we like your look!! I love your coat Bonnie, and you look so adorable! :) I can't wait to see more of your quirky looks this winter! Also, you should wear brown more often! It looks good on you! Especially this caramel shade. I love this color of coat! Great style and wonderful photos! fantastic look. your coat is adorable! I LOVE its colour. I love your top and jacket! Hi! Thanks for your comment!<3 The beret is not mine - this is my best friend! I'm the girl with the blue coat! Great pics, love your coat! First of all, thank you for your compliments on my blog and for giving me the chance to discover yours, which is very enjoyable! I value great style, and you sure have it, girl! BTW, that coat is insanely gorgeous and I love the way you combined it. 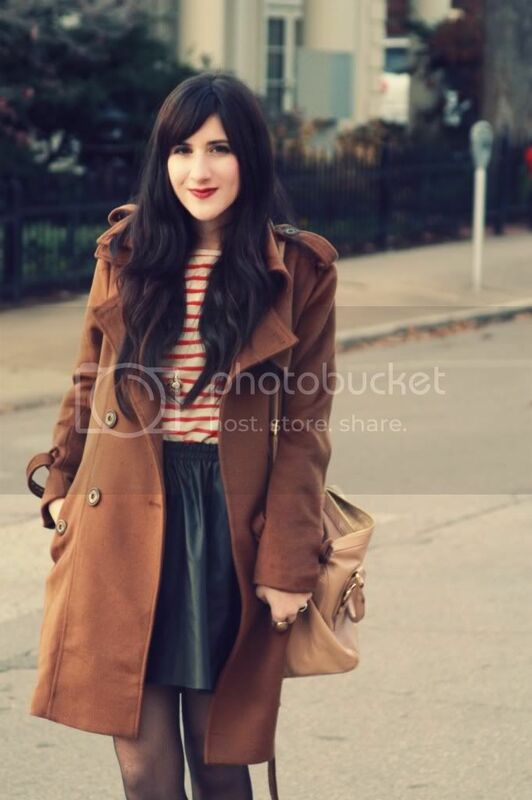 You look great in brown and I love that you added the black leather skirt and the red striped top. I never thought about it before, but you're right, the colder it gets, the crazier my outfits get. I think it's because I get restless in pants! holla, thanks for stopping by at my blogs bytheway.. and i just discovered your blog, and its so wonderful. i like it.. your style, i like it. I like your way to combine al the outfit..
and im following you now..
Fabulous outfit! Love the striped top. The color of that coat is really beautiful! Such a classy outfit! I love it! Btw, what camera do you use? And how do you get a vintage effect on your photo's? Is it a feature on your camera? 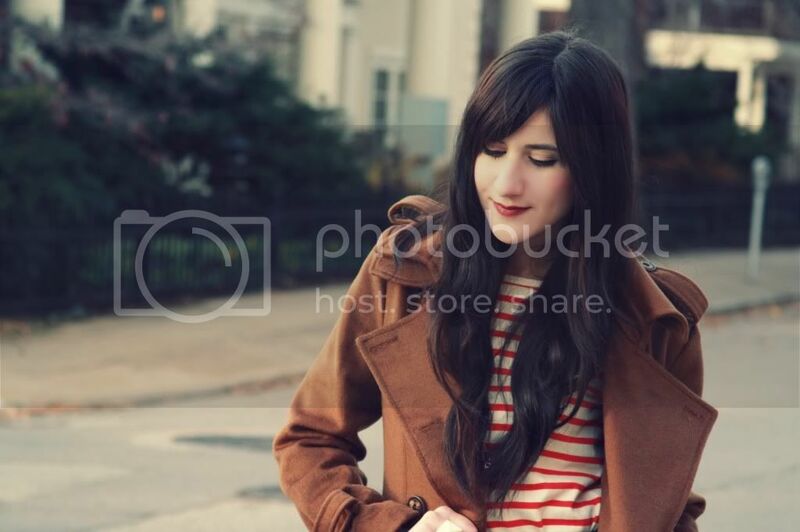 love the coat and striped shirt ! You look so chic! The color of the trench is gorgeous! Oh, what a great winter coat! You look pretty! Aww I thought I'd see chocolate cake somewhere here, hihi ;) Nice coat! Thank you for the comment! I love your style so much!! I am following now. Keep up the excellent work lady! Just found your page after meeting with some Conde Nast people who recommended you. Love this, am a new follower. I am obsessed with that trench! Where is it from ? !